I spotted these in the Sally Hansen kiosk at Parcos, Infinity Mall, Malad, Mumbai. They looked very similar to the pics I had seen of the sand texture ones launched by OPI. I really wanted to try out this texture so picked out 2 shades from it – Lady Luck and Be-Jeweled. Let’s see how they fared. They come a oval shaped glass bottle with an hour-glass shaped metallic cap. The whole thing stands about 2.5 inches tall. The texture is very grainy actually it is all glitter of different sizes. It is kinda gritty to touch. 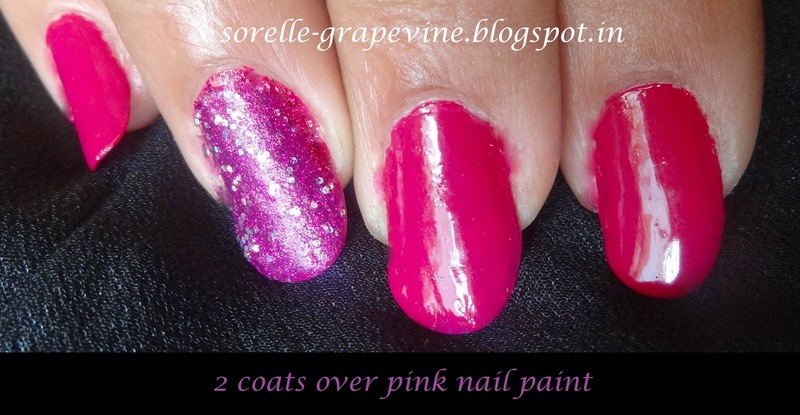 I have tried these several different ways – 2 coats on plain nails with/without top coat, 2 coats on 1 coat of matching nail paint with/without top coat and 1 coat on 2 coats of matching nail paint with/without top coat. I found that the way to make them last the max is to apply it like a top coat on your 2 coats of nail paint. The reason for this is that they chip really really fast like sometimes in a few hours of application. And they don’t chip like frayed tips kind but big chunks coming out oh-I-have-to-change my nail paint kind. And coz of the texture which is so choc full of glitter they can be a major pain to get off. Cotton or nail wipe you might use end up getting caught in it. You have to go to town rubbing these to get em off….actually you are better off by just chipping what ever possible and then removing the little left with remover. I have seen that it is easier at times to remove such glittery textures with Lakme nail polish remover. I did not have that with me when I tested these so cant comment on that. They look very pretty and I wished that they lasted a little longer. The problem is the more you put on as in layers/coats the faster it chips. My sis didn’t like this pairing. I don’t know why I like it. What do you guys think? Dig or Ditch? But if you are not iffy with having to redo them often then these are perfect to add the little dazzle to your look. I’m posting pics of different ways I could think that they could be worn. 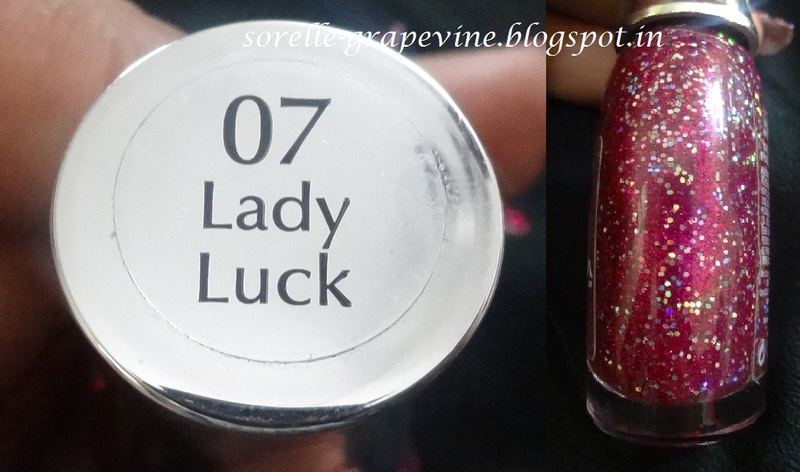 Lady Luck is a deep reddish pink small glitter particles with multicolored chunky glitter. 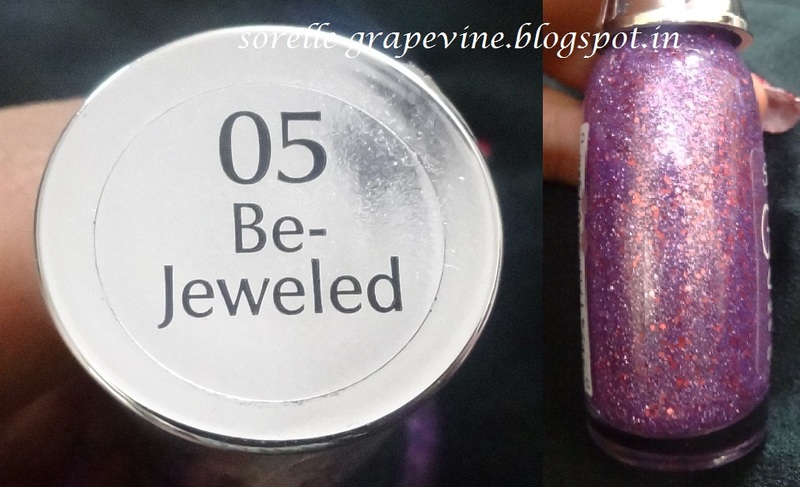 Be-Jeweled is light purple small glitter particles with light pink chunky glitter. If you wear them on bare nails they go on very streaky. I really like the colors and the how different these look but the texture and the problems that come along with it have put me off. Such a pain to get off and then they chip so fast…..spent so much time touching up or even redoing these *sigh*. If someone knows something that I have not mentioned and makes them work then please do let me know. Price is Rs. 450/- for 9.17 ml of product. What do you think of them? Will you be interested in trying them out? How would you wear them? Write in your thoughts and ideas. Waiting to hear them. Catch you next time – Bye! Would you purchase Sally Hansen Gem Crush Nail Color again? – These I will not even thought there are aspects about them I love. Would you recommend Sally Hansen Gem Crush Nail Color to your friend? – No!